Upon visiting the L.S. Lowry exhibition at Tate Britain in London in October 2013, my notion of a city was developed as I added a critical view towards the concept of a crowd. By observing that the urban landscape went through a metamorphosis process, I was able to relate its historical legacy with the present times in a richer manner. A city is a place where sets can be built and where individual performances take place whilst the crowd behaviours gravitate around the dynamics of the city. 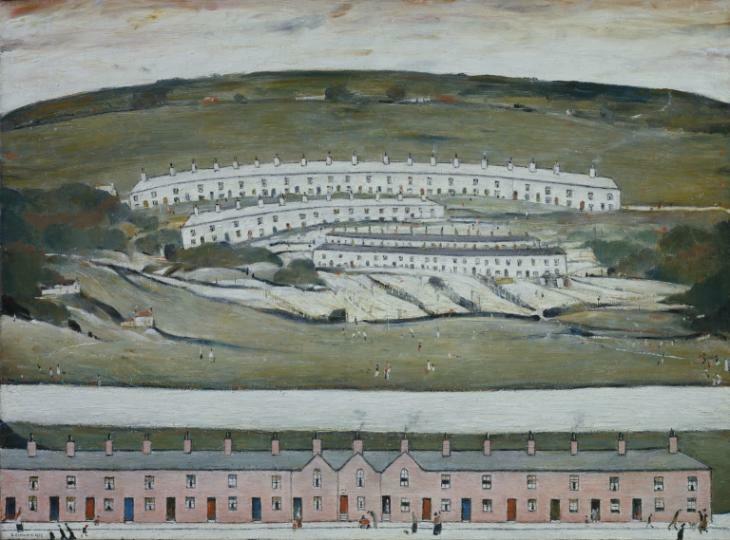 Lowry´s paintings portray some of those behaviours contextualised in an industrial city. He documents his own contemporary society and its traditions while embracing the notion of human melancholy and loneliness — feelings that can become more relevant and evident when one is imbibed within the crowd. His paintings aren´t solely portraits of a single individual personality: they also embody the whole crowd, which can be thought of as the personality of a city. He has found interest in the suburbs and outskirts of the city and portrays those as unique sites that cannot be found nowhere else but in England. His paintings of cities show neither trees nor vegetation, but still show beauty. His work sometimes evidences urban landscapes similar to the ones we have nowadays. Probably we might have a less polluted environment in England but our streets still have the intense human density, likely even more compared with the 19th century. We try to compensate this density in the city by introducing public spaces and increasing their quantity, but our society still shares some of the features present 80 years ago. Some cultural behaviours haven’t changed, such as the tendency towards congregation and the excitement regarding new happenings for example. The author said: “Accidents interest me. What fascinates me is the people they attract. The patterns those people form, an atmosphere of tension when something’s happened. Where there’s a quarrel there’s always a crowd” (Lowry and the Painting of Modern Life – Catalogue exhibition. Tate Britain, London 2013). The urban Landscape in his paintings depicts people’s lives, feelings and interactions but it seems to raise the question of the intended purpose of the urban landscape. Who will experience it? What is really behind a city? By the mid-20th century, the English metropoles — like Manchester, Liverpool, London and Glasgow — were dark grey places featuring heavy industries. Lowry´s work describes the processes behind the industrial revolution: a society that is a product of an industrial economy; its working class as well as the simplicity of the common man; the production in mass and the notion that all cities are factories — the urban factory. As a possible consequence of his time, he uses real colours, with grey tones, a pastel palette and, sometimes, the contrasts of luminosity, quite frequently a whitish sky on top of a dark city. Today, by looking at our streets people can realize that our society is still unfair but, in the end, each individual is still an optimistic believer.